There are hours of delay to receive mail from mail domains hosted by Microsoft Office 365 due to greylisting. Servers used by this service are present in greylisting_whitelist_domain_spf table of iRedAPD database, so these servers should be whitelisted? What is the behavior of SPF whitelist for greylisting? Is sender address must be on the whitelisted domain (@outlook.com) or could be on tiers domain (@company.com) and use Office 365 service? It should whitelist all mail servers (for greylisting service) specified in SPF DNS record of mail domain name 'outlook.com'. But outlook.com is in greylisting_whitelist_domains table yet and all IP and CIDR listed in SPF DNS record of mail domain name 'outlook.com' are in greylisting_whitelist_domain_spf table. Why mails from mail-db5eur01on0068.outbound.protection.outlook.com[104.47.2.68] are greylisted if 104.47.0.0/17 CIDR is present in greylisting_whitelist_domain_spf table? iRedAPD was not up to date, in iRedAPD 2.0, greylisting plugin doesn't look in greylisting_whitelist_domain_spf table for whitelisted servers, upgrading to 2.1 should solve this. This doesn't work anymore, or does it? I executed the script and added "spf.protection.outlook.com", as this is an SPF record for office365 customers. The senders domain also has this record set, but the Mails are getting greylisted anyway. and then never reach me, because every retry from office365 is from a different IP. Please do not reply in other's thread, especially it's years old. Which iRedAPD are you running? could you upgrade iRedAPD to 2.7 and try again? Okay I see, there may be a misunderstanding. spf_to_greylist just reads the spf records of a domain and add these entries to the whitelist, right? , so I thought you could add this entry to the whitelist. Now I just added the o365 IP range to the whitelist. 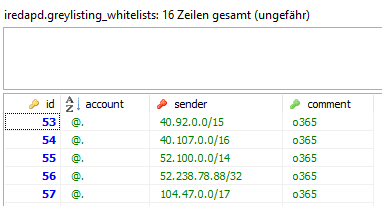 Servers listed in SPF DNS record of Outlook servers (microsoft.com, outlook.com) are whitelisted by default. You can find it in /opt/iredapd/SQL/greylisting_whitelist_domains.sql, it's imported while upgrading iRedAPD. 52.101.130.67 is in 52.100.0.0/14, which is in my greylisting exceptions. And yes I see, 52.100.0.0/14 is learned from hotmail.com automatically. But obviously, it doens't work. Shall I open new topic? Hello, the problem is still present, mail from 52.101.130.47 greylisted. So every other mail from office365 will be still blocked, if I don't whitelist every senders domain, which is nearly impossible. This is not expected. Could you please show me output of commands below? # Check whether outlook.com is whitelisted for greylisting service. I can see outlook.com has network range "52.100.0.0/14", it contains IP "52.101.134.105". So it should be whitelisted (for greylisting service). Btw, which version of iRedAPD are you running? Please make sure you're running the latest iRedAPD-2.7 (at least 2.5). * 1 mail domains in total. I use 2.7 and newest iredmail/iradmin-pro. - Does this real mail domain name have correct SPF record? - Did you already whitelist @outlook.com (SPF)? If yes, then it's ok if the real mail domain name doesn't have SPF DNS record. Btw, it will be easier / quicker to troubleshoot if you show us the real mail domain name. # Make sure _cidr is IPv4 network and in 'same' IP range. Restarting iRedAPD service is required after applied the patch.